Small ZX meeting Kaplicon 2006 finished. My photos from this event you can found here. Sweet's photos is available here. already exists. I will fix it as soon as possible. 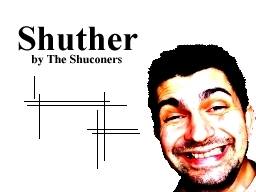 Shucon is over, but shucon crap ZX demo called Shuther wasn't released. Now, I'm preparing samples and awaiting Wixet's part. I successfuly arrived on Shucon party. Click to "Read more..." for actual visitor list. Shucon party is very near (aprox. only 34800 seconds). So, I prepared some fun postcard for all shuconers. BTW: Thanks to Johnny-X for Real uncle Hollis postcard. I upgraded to the Fedora Core 5, after many horrible nights. I download and recompile many programs today. But, I find some problems in playvtx-0.9.1 and xmms-vtx-0.8.1, if you want use with library libayemu-0.9.5. So, I prepare patches which fix this configuration problems. Patch files you can download here. I made great collection of multicolor images for ZX Spectrum 128k, +2. This collection was not published on the Forever party (due to various serious reasons... grr). Go and get it here: download / speccy. I start build my own instance of MB02+ (interface for best computer ever - ZX-Spectrum). Photos of my soldering progress you can see here. BTW: Many thanks for help from 8BC team, Omega, MB-Maniax. Speccy : Poke in Czech TV broadcasting. Many friends ask me about my very long (30 second) interview in Czech TV programme about old computer games. So, if you want enjoy it. There is link for download. Yes, I'm a famous. I was in TV. BTW: Big thanks to Ruda M. for grabbing.